Here are the slides from my talk for novice WordPress users. 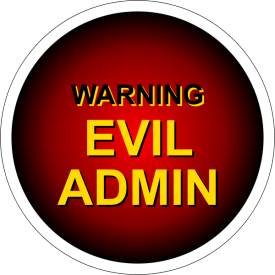 I have been noticing a LOT of people named “admin” have been locked out of a few of my client websites. That means somebody tried to log in and then used the wrong password or maybe just the wrong user name/password combination. You don’t remember if your user name is a short name or an email address. You try a couple combinations and finally get it right. So why am I (website contact person) getting all these “locked out user” notifications? I’m seeing these attempts since I recently installed the quite wonderful iThemes Security plugin. It evaluates and protects a WordPress website from more than 30 vulnerabilities. IF you install it AND set it up! BTW, you know you have to do more than install this (or any) useful plugin? You have to step through the suggestions for making your site secure and then DO WHAT IT SAYS! Imagine it? Recently I had a request from a client, named Gene, to fix a slow site. Gene thought it might be the host’s fault. Nope! Too many plugins, too many not updated, and WordPress too far behind. But the worst was the plugins installed and activated that were not even set up to actually do the stuff they are supposed to do. It’s kind of like buying a book and figuring that once you own it, so you know what’s in it. And you know that’s not true, right? RIGHT??!! Because I know that my sites do not have any of these user names, I know it’s some baddie trying to get in using brute force (big computers) to guess your password. Pretty soon the baddies will find your actual name, “Gene,” so you probably have a user named “gene” and they’ll start working to guess that password..
That starts with an S and that stands for you know what and it STINKS! I’m saying CHANGE IT FOR REAL! Don’t use a word from the dictionary. Don’t use your birthday or your address. Don’t use your kids’ names. Here’s a story about a guy who used his passwords to change his life. It’s creative and affirming and that’s the way to really use a password! Step by step screen shots of what to do to add images, insert URLs and much more. How hard is it to tweak a WordPress website? and you know you need a web site. Good for you to know that! Let’s say you also think it should be simple. Then your ask your “webguy” (who may also be a gal) to make some tweaks: change the colors here and there, add some functionality, change the header, add some stuff to the footer, see what it would look like with a red line across the top. If your webguy isn’t really top flight, while he may be able to make those changes, if he doesn’t make appropriate comments in the code which neither you nor your visitors will see, when you decide to change things you could be in for a big surprise—heck, he could be in for a big surprise when he can’t remember what he changed and where. Only it’s not so easy-peasy. And that process will probably take more time (read: more money) than building the site did in the first place—especially if your brother/cousin/neighbor did it the first time for free or almost free! Each different theme author could, for example, name different parts of the design with differently. So your new “guy” will first have to decipher what the old “guy” did before any changes can be made. If the theme you chose was not well written in the first place, it could be even harder to figure out. How can you minimize the headache of adjusting to your second website? You do need a website, to prove you’re a real business. It doesn’t have to be fancy. Make as few changes to that theme as possible. A form generator for your contact page (I love GravityForms!) and, of course, your content. Then leave your site that simple for a while. Work with it. Add content. Think about what things you wish it did. Explore the sites of other people in your business. Make a WRITTEN list of what you want to change and what you want to stay the same. And then, ONLY THEN, find a REAL WordPress Person to adjust your site as necessary. Finally, ask if it would be cheaper to start from scratch or fix what you have. Ask for a written proposal including language about what happens if the “guy” finds that the process is more complicated than originally planned. We specialize in fixing broken websites. So if you want what you have (or almost) but you want it to do more, then contact us for a complimentary strategy session. I’ll be able to tell you, in probably less than a half hour, about the process and what you should do to be ready for it. Posted on August 11, 2012 September 16, 2012 Categories WordPress TipsLeave a comment on How hard is it to tweak a WordPress website? Why can’t I just copy and paste my article from Word into my WordPress website? When a word document is directly imported into a WordPress site, all the formatting that is applied to your article—the italics, font size changes, bullets and numbers that make it look the way you like—come along with the content in little bits of code. Your website has its own system of consistent formatting in place—called a cascading style sheet because it sets the style for the whole site. That style sheet makes the headings on all the pages the same color and font, makes the bullets and numbers on every page where you use them have consistent styles, keeps the columns consistent, etc. This is a big piece of what makes your site look cohesive and professional. When your computer displays any page on the internet, it uses the code that is closest to the content to control that formatting. The code that came over with Word is attached directly to your content—much closer than the style sheet of the site. Therefore, Word controls the look of that page. Pretend you decide to change the color of all the headings on your site, say from black to blue. If you let the website style sheet control the look of your site, then that change to the color of ALL your headings, is literally a change to one number on one page. If however, you have copied your content from Word, then that one number has to be changed on every single page and at every single place on the page where the original color was designated. THAT takes a lot more time. And will cost you a lot more money! You are most probably NOT doing your web designer any favors by supplying long MSWord articles with lots of formatting because before the content can be posted, the code must be cleaned up before the new styles can be implemented. Supply your articles in plain text. Save as a .txt file using Notepad, for example. It’s also a good idea to turn off the Word wrap function found on the Format tab. (You’ll wind up with a couple of very long sentences. Don’t try to read them. Just copy that text file and paste into WordPress. THEN put your formatting in place using the buttons that are very similar to the buttons on Word’s formatting tool bar. Posted on January 7, 2010 November 10, 2014 Categories WordPress TipsLeave a comment on Why can’t I just copy and paste my article from Word into my WordPress website?